Is Get Out scary? Not too much for wimps like me. You have no excuse to miss it. If you’re like me, you are a scaredy-cat, a grown little baby, a wimp who doesn’t like scary movies precisely because they are scary movies. Why would someone pay to be scared? That’s like paying to be yelled at by your boss. Scary movies are like comedy, but instead of laughing, you’re tricking your brain into thinking it’s in danger. Why? Who knows. Now, I’m not here to yuck anyone’s yum. If you like scary movies, this post isn’t for you. You’re already living a fearless life that I’m sure is full of endorphins, and you’ve probably already seen Jordan Peele’s Get Out. This post is for those who keep on hearing how great it is, but don’t know if they can handle it. To my coward friends, I’m here to say, the water is fine—go see Get Out. Up until yesterday afternoon, I was just like you: I heard that Get Out was supposed to be great but was unsure I could make it through the whole thing. I’ve only seen one horror movie in my life—Texas Chainsaw Massacre, for a story—and hated it so much that I couldn’t fall asleep and am still occasionally haunted by images from it. Pals and colleagues told me Get Out wasn’t that bad. “It’s more of a thriller,” they’d say. I don’t think my friends and co-workers are a bunch of dirty liars, but that’s just what they always say. I have been burned before. People who enjoy scary movies are not reliable sources for how scary things are, the same way that I am not a reliable source about how spicy Thai dishes are. My senses have been dulled. If you’re a person who’s seen a lot of scary movies, you may think you’re normal, but to people like me, you’re not: You are a creepy creep robot who no longer can be shocked or grossed out. Now that my wimp bona fides have been established, you can trust me when I say you definitely can see Get Out. Spoiler alert: I am about to very plainly describe frightening things that happen in the movie, in order to prepare you. If you stop reading, there will be things that scare you, which I can’t, in good conscience, recommend. I find that knowledge gives me a sense of control that makes sitting through a film much easier, so, first things first, watch the trailers. As horror-movie trailers tend to do, they include the scariest bits from the movie. (Side note: I’d pay an extra $5 for a movie if I were assured there wasn’t going to be a scary-movie trailer. “Oh, you’re going to see a dumb comedy where teachers want to fight each other? Before you do that, we’re going to show you the scariest 120 seconds of a movie about little twin girls who murder their family with backwards German kids music!”) In the case of Get Out, the trailer thankfully gives away the most startling jump scare in the movie: when Daniel Kaluuya and Allison Williams are driving and a deer flies in front of their car. However, I should warn you about three others. The first comes in the first scene, when Lakeith Stanfield is walking around the suburbs and a man comes from behind him. My trick for this scene was just to look down until the music told me what happened. I won’t give away the other jump scares, but I will say that one is played for a solid laugh, and the other two come at the end, and you can basically predict what’s going to happen based on how the action is going. And if you’re someone who gets freaked out by blood and guts, Get Out is not gory at all, full stop. There is some blood in it, but nothing beyond what you might see in an R-rated action film. Rest assured there is not one saw in the entire movie. There are also no creepies in masks or makeup. No splices. No clowns. Instead, the horror is mostly tonal. Things are meant to feel scary and they do, very effectively, but nothing is scary in the way you probably fear. For comparison, it’s about as scary as the M. Night Shyamalan movies I’ve seen. For an even more accurate comparison, it’s almost exactly scary as the scariest Key & Peele sketch “Make-a-Wish.” I know you’re probably still worried and that’s good—that gives the film its juice—but, at least for me, knowing I would be fine did a lot to ease my worried mind when actually watching the movie. And even if you hate scary movies, it’s worth enduring a slight bit of discomfort to see Get Out. Like me, you’ll probably miss all of the horror allusions (though, like all things, watching The Simpsons helps in understanding the universe a little), but you’ll still have an enjoyable time. The movie is surprisingly funny—though maybe that shouldn’t have been a surprise, considering its pedigree—and Lil Rel Howrey as a TSA agent is worth the price of admission alone. 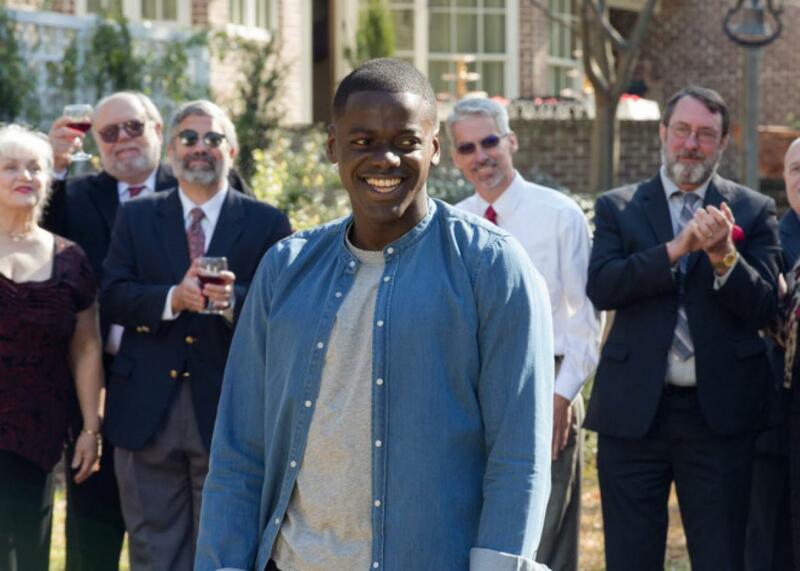 Beyond that, Get Out is the rare satire that’s incredibly effective without being heavy-handed. Peele set out to use the genre to help viewers understand how scary it is to simply be a black person in America. So, despite my heads-up, you will still probably feel a little scared watching Get Out. But don’t worry, that’s the point.